For the 2011 Contact Photography Festival, the Museum of Canadian Contemporary Art exhibited a series of images by Viviane Sassen called "Parasomnia". Sassen is a fashion photographer in Holland, and as a child lived in Kenya where her father, a doctor, ran a medical clinic. Her return visits to Africa began in 2002. he images were captured in Senegal, Kenya and Tanzania. What I found striking in her work was its non-documentary feel. 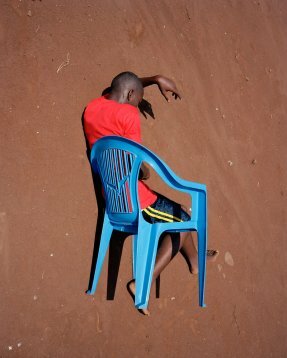 By that, I mean Sassen's pictures don't appear to "capture" daily goings-on of their subjects. Instead, they're alluring for their use of bold colour yet remain distant as subjects pose to avoid the gaze of the viewer. These images are thoughtful constructions by an artist with a point of view that is informed by multiple perspectives. Sassen's pieces was part of an exhibition called "Dynamic Landscape" which also included works by Olga Chagaoutdinova, Scarlett Hooft Graffland and Dayanita Singh.